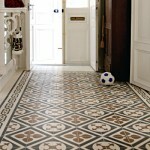 You’ve invested in beautiful Encaustic Cement tiles. Now you’ll need to learn how to finish and care for your new tile installation. 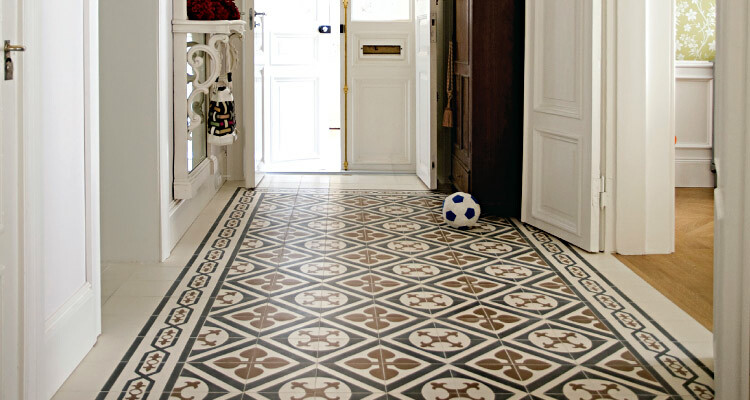 A quality cement tile should be compact and waterproof. This means the decorative surface must be sealed correctly to protect it from stains (including grouting stains), dirt and debris. But before learning how to seal tile, it is helpful to first understand how cement tiles are made. Cement tiles are built in three layers: the surface layer, which is decorative; the middle reinforcing layer of mortar made with fine sand and portland cement; and the bottom layer, which further reinforces the tile and provides thickness. The bottom is made with course sand that provides “tooth” in the bonding material used in the tile’s installation. The layers are poured one-by-one into a special mold and then hydraulically pressed and finally cured. Cement tiles are very porous and must be sealed with a quality tile sealer before grouting and again after the final cleaning and drying of the installation. When choosing a cement tile sealer you should look for qualities like scratch-resistance (meaning a good hardness rating), UV protection, and a long performance lifespan — 10 to 15 years is ideal. The directions below are applicable to TK6 Nanocoat or TerraNano Sealer. Be sure to adjust the procedure if other products are used. In addition to the instructions I am about to impart, always follow the directions provided by the sealer manufacturer. Step 1: Select your cement tile sealer. Remember to choose a high quality sealer to help decrease maintenance costs over the years. Available finishes include matte, satin, low gloss or high gloss. Note that the glossier sealers will show scratches and wear more readily that a matte type finish. Step 2: Set the cement tiles into place (without grout) using the tile manufacturer’s installation instructions. I recommend mixing tiles from the boxes to help disburse natural color variations. When installation is complete, clean the surface with water and wipe it dry. The entire surface area must be free of excess moisture, dirt, debris, oils or any other residues. Important: Do not clean the tiles with anything containing soy or d-Limonene. These substances can interfere with the bonding of the cement tile sealer. And never use any type of acid or acidic cleaners on cement tiles. Step 3: Before applying grout, apply the tile sealer to the top surface of the tiles. The best method for application is with a pump-up sprayer, microfiber pad, or short-nap paint roller. First, dampen the pad or roller prior to starting the cement tile sealer application. Next, spray on a liberal coat of the sealer and then spread it quickly with the microfiber pad or paint roller. Spread the sealer using motions of “V” and “W” or arcs and swirls. Do not apply the sealer in straight lines. Note: It is advisable to have a helper. One person can spray the sealer while a second person follows behind, working quickly to spread the sealer over the tile surfaces. An alternative application method is to use an HVLP or airless sprayer with 50-70% overlap. Step 4: Once the initial coating of sealer is dry, apply the grout. Be diligent about keeping excess grout off of the surface of the tile. Minimal residue can be cleaned off at the end of the process. Step 5: Thoroughly clean the tiles of any excess grout or residue. Any grout left behind will be sealed over and will remain on the tile for the life of the sealer unless you sand off or strip the sealer from the tile. Step 6: Prepare the tiles for a second coat of sealer by lightly sanding their surface with fine sandpaper (available at any home improvement store). This will create a slightly textured surface to allow for proper adhesion of the second coat of sealer. Step 7: Vacuum away any tile dust and wipe the floor clean. Then apply a second coat of cement tile sealer following the directions in step 3. Step 8: Allow the floor to dry according to the time specified by the sealer manufacturer, and then enjoy your cement tile floor! Be sure to check it from year to year to evaluate its condition and to re-seal the tile as needed. Expert tile installation advice is always available at the John Bridge Tile Advice Forums.